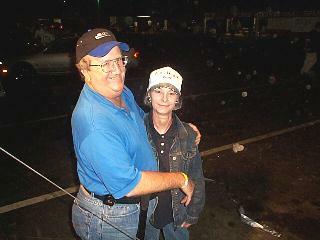 2001 Snowball Derby (Pensacola)-To say the Snowball Gods have not been kind to us over the years would be an understatement. Every year I seem to find a new way to tear up a perfectly good race car. Last year, the left quarter, drivers door, left & right front fender and nose piece were all off the car by the end of the race. This year we vowed it would be different, I grew what is now known as the Derbee Goatee and we had a new format for move in and practice that made the weekend a lot more relaxed and enjoyable. Mark Davis, hereinafter known as the tire doctor, and his team moved in next door, we erected a huge tent from Blue Rents and we were quickly the envy of the garage. The Doctor immediately began work on soaking the tires. Tire soaking is illegal at most tracks but not at the Derby and since the Doctor won last years race by a long shot he had a lot of patients looking for advice. While everyone else was just now making an appointment for the Doctor I had been in a week earlier and already had my prescription filled. When practice began on Thursday all the hard work the guys had put in at the shop paid off, once again they had given me a very good race car. We spent the 2 practice days trying to tweak on what we had without going too far, we even had enough confidence to skip a couple of the sessions. I qualified the car 18th, which was somewhat of a let down for me, the guys had given me a top 10 car and I overdrove it. However, I think 57 tried to make the field so I was happy to be comfortably in the field. During the week I had arranged for Rick Crawfords crew to pit my car on pit stops, they were simply awesome and we couldn't have finished as well as we did without them. For the first time I felt good about our chance at the derby, we had a good car, a great pit crew and the Doctor's tires. The race started without major incident and we quickly clipped off some laps, the car was great and we were just riding waiting for a chance to change tires and make a run for the win. Around lap 25 some of the cars got together and we had a long caution, when we went green the car would just not turn left anymore (it was pushing), I knew I was burning the right front up but we needed to stay on the lead lap so I had to keep pushing the car. 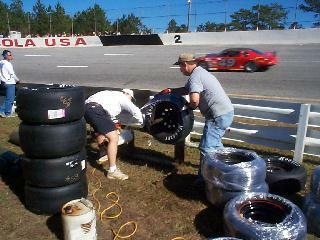 Finally, we got another caution and I was able to come in and get new tires. Little did I know how hard the was going to be. Crawfords crew went to work and quickly had the tires changed but Gator, the jackman, waited for along time to let me down. 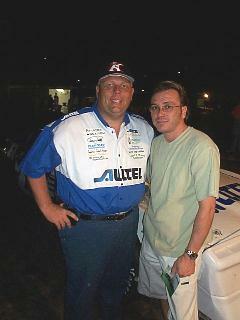 Once I was finally gone Gator told me I was missing 3 of the 5 studs that hold the tire on the right front of the car. They quickly found 2 and put them on and we went back out with 4. All of this and these kept me on the lead lap. Back on the track I had fresh tires and we quickly worked our way back through the field up to 10th and the last lap I turned the car around trying to get under the 9th place car and we had to settle for 12th. 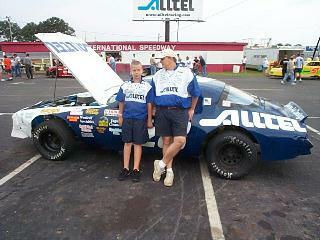 I spent Sunday out at the ALLTEL booth with Kevin Brill, our show car and the Ryan Newman Simulator. Kevin had arranged for the booth and cars to right at the front gate and I couldn't get over the number of people who stopped by. 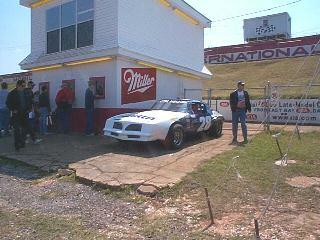 All in all it was great weekend and it was the first time we didn't need a wrecker at the Snowball. Our home base for the Derby. Our tent was in front of the haulers. 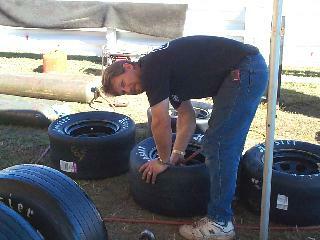 The Tire Doctor, Mark Davis, at work. A couple of the Doctors nurses at work, Patrick Holliway and Danny Walker. 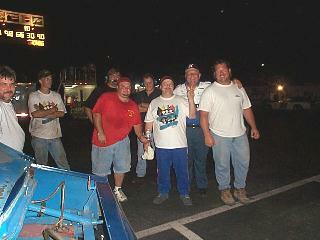 Rick Crawfords pit crew ready to go to work. 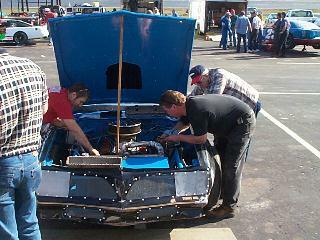 Ricks pit crew at work. September 15th Cooley Barnett Mobile-After the terrorist attacks we went to Mobile with a heavy heart but felt like it was what we needed to be doing. Bill Roth put together a stirring Patriotic salute in the prerace ceremonies. 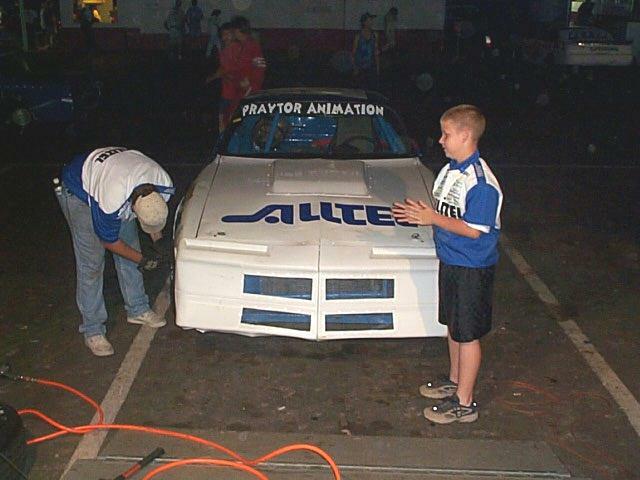 Since we were the first guys to race, we were strapping in during the prayer and the National Anthem, for the first time in a while I caught myself stopping, taking time to pray and sing the National Anthem. I hope as the events of the week fade in my memory I'll remember to make this a part of my regular routine. The guys gave me a very good race car off the trailer, we made a few changes but not many and had a very good qualifying time with a 6th place starting spot. Two laps into the race I got together with the pole sitter and cut down the left rear tire. the guys did a great job of changing it, we stayed on the lead lap but a long way from the front. We needed a caution in the worst way but the race went green the rest of the way and we had to settle for an 8th place finish. The good news, it was the first time ever that we didn't need a wrecker for the Cooley Barnett. A rare site for Cooley Barnett-the same before and after the race. 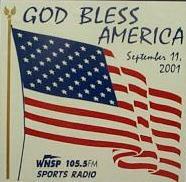 The special sticker we ran in remembrance of the victims of the attacks. 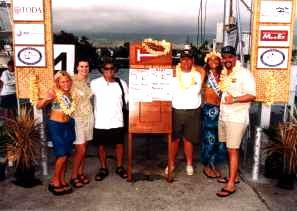 Tommy was part of The Outdoor Channel Fishing Team for The Hawaiian International Billfish Tournament in Kona Hawaii in August. On the last day Wade Sherman and Tommy caught 2 Blue Marlin at the same time on the last day of the tournament for a 9th place finish. 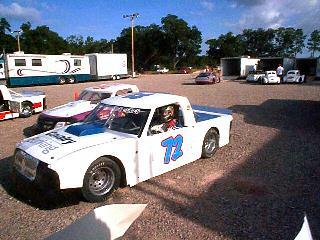 Everybody wants to drive the truck---Tommy drove the truck, at Sunny South Raceway in a test session on Friday 7-27-01. July 28th ALLTEL Meet the Driver Night-ALLTEL Meet the Driver Night was a mixed bag for our race team. The not so good side was on the track. After our first practice session we were suprised with a mandatory engine inspection of our car. To have your motor inspected you have to remove all the spark plugs, the right side valve cover and the rockers arms on 2 cylinders. Then the motor is tested and sealed. Unfortunately, we did not find out until after 5:15 that we would have to have it inspected, so we missed our last practice session and we weren't able to get the motor put back together in time for qualifying and we missed that too. The suprise inspection of our car really set us back because we had a new, very aggressive setup under the car and we really needed a chance to check it out. We also didn't have a qualifying time so we had to take up the tail end in both races. Since we didn't have any real practice on the setup we used the first race as a practice to get ready for the second. Needless to say we really stunk the joint up in our first race and we realized we needed to make some really big changes to get ready for the second race. The guys went to work and changed out what normally takes half a day in the shop in an hour. Man these guys are awesome. We started dead last in the second race and were able to make our way up to a 7th place finish. 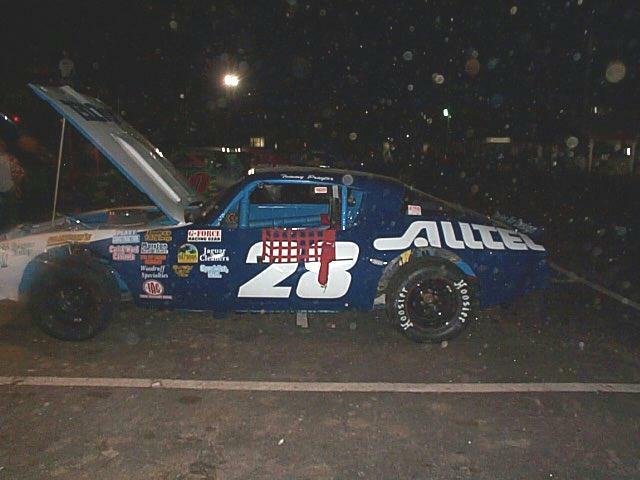 Its really too bad because with just a little tweaking we could have had a great race car. 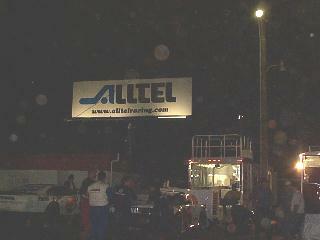 The good side or I should say the great side of the night was ALLTEL's Meet the Driver Night. Our team and most of the other drivers went into the stands for intermission, handed out pictures, signed autographs on just about anything you can imagine and had a great time talking with some of our fans we don't get to see after the races. Our guys tried to keep up with how many autographs and it was just under 500 in less than 30 minutes. 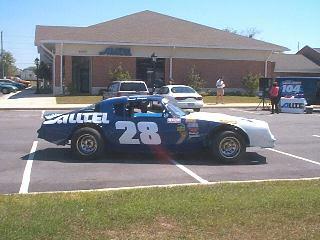 The show car in front of MIS for meet the drivers night. 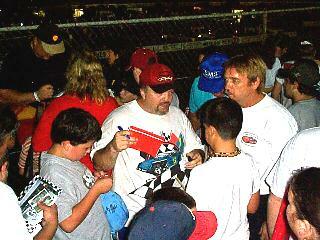 The greatest fans in racing turned out for the autograph session. We signed just about everything. 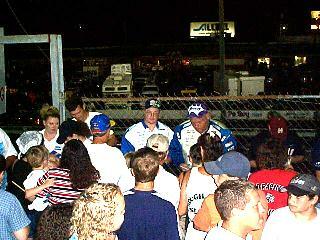 Okie Mason gets mobbed by fans. Thanks again to all the drivers who participated. 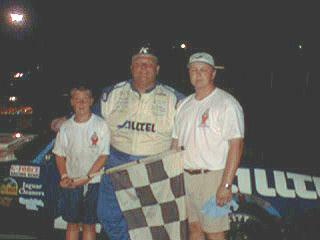 July 7th 2001 Mobile-After Friday Night in Pensacola we had a lot of work ahead of us and the guys responded to the call. 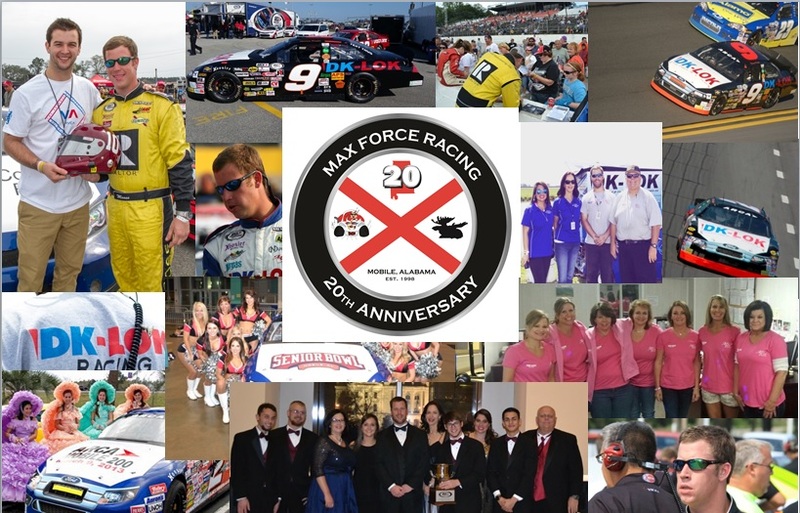 We had some things that still needed to be fixed and we had to change our set up from Pensacola to Mobile. They worked all day and we were running late to the track again and we missed the first practice session. We got a little practice and qualified. The car still wasn't right and the guys went back to work again, changed just about everything and we rolled out to race. It took a little over a lap for me to get use to the changes and we set sail. The only time the other guys even got close, was when I over drove the car into the last turn and one of them got a bumper on me but not enough to take us out. As I rode around the track on the cool down lap, I just couldn't believe the guys were able to give me another winner. Last week the Press had us totaled and here we were back in a week with a winner. You'll get tired of hearing me say this but, Patrick Holliway, Thomas, Tom Claxton and John Phelps make it happen every week for us. This week we added Shane Wilson and he is already making big contributions. They said I could have a good race team or a pretty one. 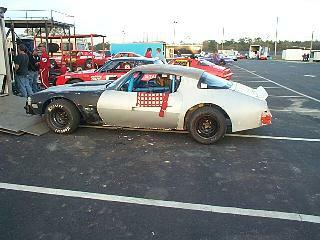 July 6th 2001 Pensacola-The guys were finally able to get the car finished @ 5:30 while practice started at @ 5:00. We ran into more things that needed to be fixed in our prerace check out than what we expected. We didn't get to the track until 7:30 so we weren't able turn any pracitce laps and we missed the draw for position so we had to take up the tail end of a 22 car field. As the driver I sure would have liked to made a few laps before racing but I have a great deal of confidence in the cars the guys give me. We made 2 laps and had a caution and we used it as our opportunity to make some air pressure adjustments without giving up a lot of spots. The race then went green almost all the way without a caution, which is not what we needed with so many cars to get by. We ended up 10th and some ideas on what still needed to be worked on to get the car ready to go tonight. Patrick, Thomas and Shane-part of the group of thats makes it possible. June 30th Mobile-The changes and repairs from Friday night in Pensacola made us extremely late getting to Mobile on Saturday night. We were so late, I dressed in the shop before we left and we still missed the first practice session. When we did get to practice the car was awful. We just didn't have enough time to get everything checked out. We made some minor changes to qualify and it was still bad. With a little time after qualifying and before we raced the guys went to work making wholesale changes trying to loosen the car up. 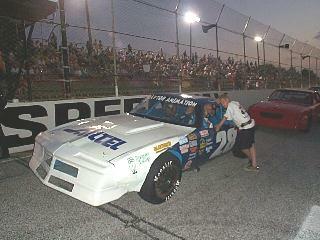 We got a little help from Mark Davis who also helped spot for us and we rolled it out for the first race. Basically, we led almost every lap and took our second win of the season. In the second race we were at the tail end of the field and had a long way to go. By lap 5 we were up to 5th and going into the last turn of the last lap we were 3rd. The 3 of us were having a great race and then for some still unknown reason to me, a car that was 2 laps down decided to try and pass all 3 of us. The ensuing wreck collected all of us and the 4th place car letting the 5th place car take the win and we settled for 6th with the left front torn off the car. 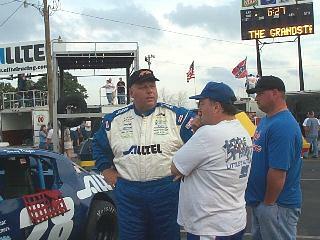 After the race I went down to talk to the driver about the move and before I left chewed out his entire crew. I worked on them so hard some of them came down to my pit area later to apologize and chewed them out again. The last few weeks I've been the lucky guy who gets to drive these great cars but our runs are a direct result of the hard work of the guys, Patrick Holliway, Thomas, Tom Claxton and John Phelps. The guys have a lot of work to do this week, there are not many moving parts that don't need to be fixed on the front suspension, but I know they'll have us ready for Pensacola on Friday night. 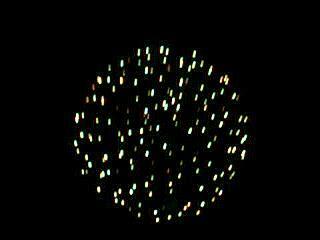 It was nice of Bill Roth to put on the fireworks show to help celebrate our latest win. 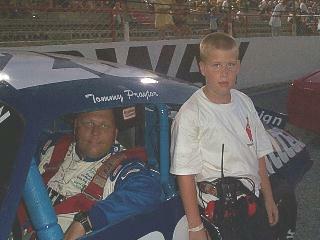 Thomas gving me a few pointers before we race. From the penthouse to the outhouse all in 1 night. 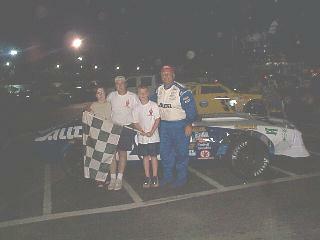 June 29th, 2001 Pensacola-To say the guys gave me a great race car would be an understatement. We went out and scuffed some tires and I made 1 lap at 80% speed and it would have put us in the top 10 qualifying for the Snow Ball Derby. We parked the car, made 1 small change and got ready to race. Since we missed the previous week that was rained out, we had to take up the tail end because the field had already been set. Starting 24th was going to make for a long night. We took the green and I was in a rocket ship, the car was really flying by the time we made lap 5 we had moved up from 24th to 10th. As the race went on the car kept getting better and we kept passing cars up to the 6th spot, when with 7 laps to go the right rear tire blew coming out of 4 and I took wild ride without hitting anything. Unfortunately the tire knocked the shock housing off and the guys tried hard to get us back out, but there just wasn't enough time and we were done for the night. What we do this weekend is a direct result of what the guys had done at the shop all week, Patrick Holliway, Thomas, Tom Claxton and John Phelps all worked over time and its paying big dividends. 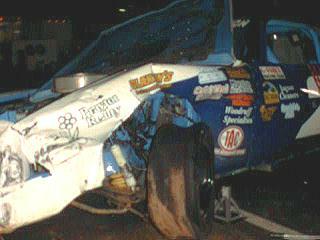 June 16th, 2001-It has been a rough two weeks around our shop and it was nice to concentrate on the car. During our pre-race setup on Thursday night we found some measurements that just weren't right on the car and we uncovered some more damage done to the frame from our previous outing. I made the decision to go ahead and race because sometimes a bend here or there can actually make you faster, well it didn't work for us. We unloaded medium to bad and stayed that way most of the night. We qualified 7th worked our way up to 4th. I ran the car off the track coming out of turn 2 and cost us 2 spots and then went to the top of the track to avoid 2 cars that were sideways and that cost us 2 spots for an 8th place finish. The car is at the frame shop and we'll have it back in time to race June 30th in Mobile. While Tom Claxton looked like a tourist work real fast. It took a couple fo weeks but one of the guys finally got a shot of Buddy Peebles best side. 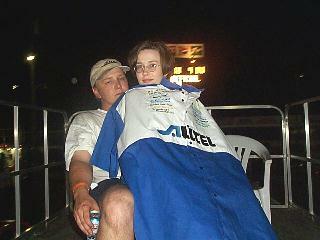 June 2, 2001 Mobile-After our great run in Pcola I was really looking forward to Mobile. 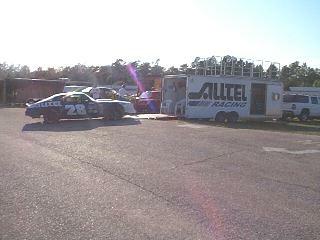 Patrick Holliway and Thomas worked on the car all day Saturday changing from the Pcola setup to the Mobile setup. On top of the regular change we through some new changes at it and wow, de we ever hit pay dirt. Of the trailer the car was extremely loose. 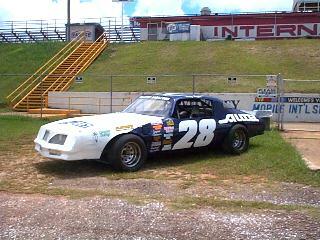 This is nto unusual for race cars but in 4 years its a first for us. We started changing ever so slightly and finally got the balance we were looking for. 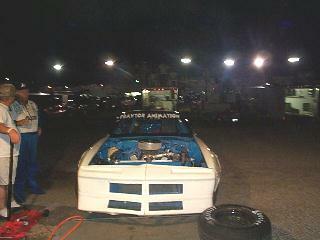 I felt like we had the heat race won but the right fron hood pin had come loose and the hood was starting to flop. I waited until the very last turn to get in the gas to pass and the hood flew up in my face. We still got underneat h him and only missed scoring a win be less than half a car length. We started on the pole in the feature and led every lap with 2 to go. Coming out of 2 another car got in to the back of me and I took a little airborne trip off of 2 out to the wall. The car had 2 flat tires and we were done for the night. While I was disappointed about the finish I'm really happy with the progress the guys are making on the car. 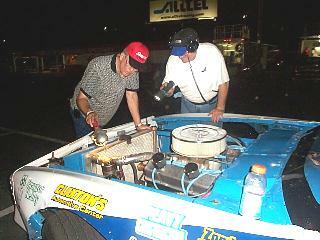 Tom Claxton & Buddy Peebles working on the car. That's me acting like I know what I'm doing and checking on their work. It doesn't get much worse than these sguys. 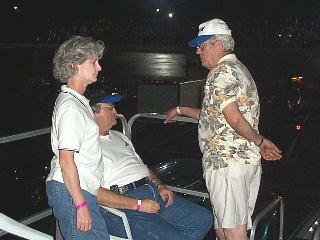 June 1, 2001 Pensacola-We unloaded at Pensacola and we were very good right off. We made a few changes after practice and started 6th on the draw. By the end of the first lap we were 3rd and riding while first and second raced side by side. We had a better car and were waiting for them to sort it out. Unfortunately, one of the guys behind us got impatient and turned us around sending us to the back. On the restart I got black flagged for passing too many cars on the start and had to take a stop and go penalty that put us a lap down and at the back again. We ran the leader down under green but couldn't get a caution to help get us back our lap back. It was a good night, we still finished in the top 10, and we are continuing to work on the right setup for the Snow Ball Derby. On to Mobile. Thomas and I before the start. The guys forgot to put the hood pins in and it went off the car like a rocket on the front straightaway. Thomas giving me some pointers, Dad don't jump the start! 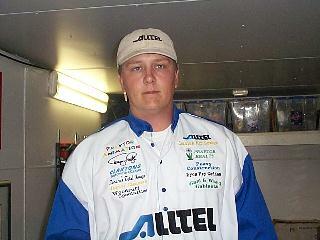 May 26, 2001-After our win I spent the following weekend in Charlotte covering the races for The Outdoor Channel. We needed the 2 weeks to repair the right front and the underside of our car from the airborne flight I took in the feature on May 12th. Because we replaced so much of the front suspension we went to the track with a lot of questions marks. Unfortunately, the answers were all bad. 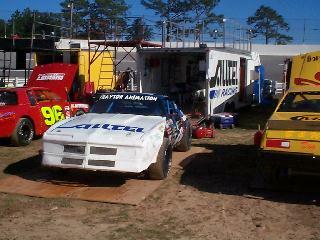 The car off the trailer was really bad and getting worse, we threw wholesale changes at it to qualify. We threw some more changes at it, got it a little better, for the heat race and then some more for the feature and finally got it to the point it would race a little and we came home with a solid top 10. It was a long night and we were short handed but John Phelps worked hard and we got some much needed muscle from Buddy Peebles. The real jewel of the night was Zondra coming back with a first race win. Buddy & Susan Peebles came to the track and we quickly put Buddy to work. Frank, from the LA Sports Cafe stopped by after the races. 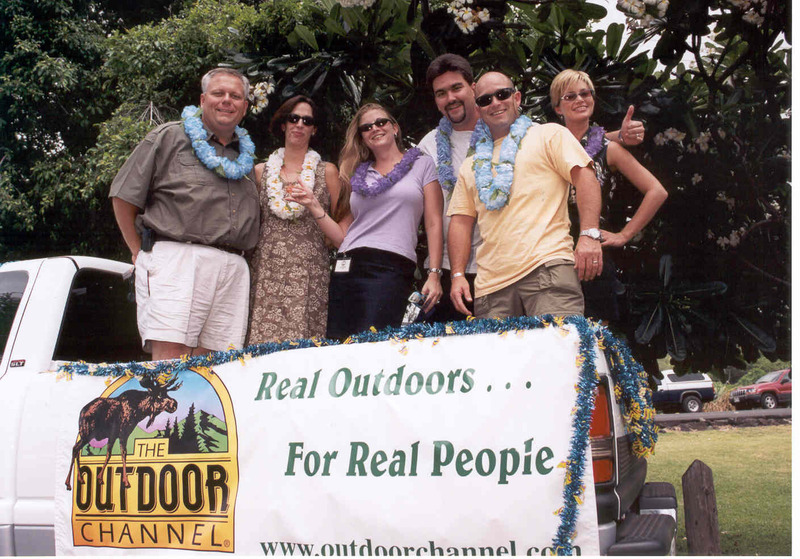 May 12, 2001-After a strong run in Pensacola we had high hopes for Mobile. We unloaded the car and it was junk. The harder I tried to drive it the worse it got. We qualified bad and then started making some serious changes. They paid off and we picked up our first win of the year in the heat race. Since we qualified so bad we had to start at the back of the feature and would have a long race in front of us. We started picking our way through the field, dodging wrecks and had worked our way up to 6th when some cars got together in front of us. I went high to miss 1 of the cars and went for a short flight off of turn 3. For only the second time in a race car I scared myself. The angle and trajectory was not good and it looked like I was going to start flipping when the car came down. I made hard impact on the right front and instead of sticking the car skidded and I came to rest at the bottom of the hill. I guess when I landed it knocked the wire off the starter because the car wouldn't start. The safety guys pushed the car back on the track, popped the clutch and we started right up. I tried to shake the car down to see how bad it was hurt before we started racing again and it felt like I had a tire going down. Being the smart guy I am told myself it wasn't happening and took up our spot at the tail end of the line. The first few laps the car felt different but pretty good. We got another caution and then let it go the restart, passed a few cars and ended up with a an 8th place finish. 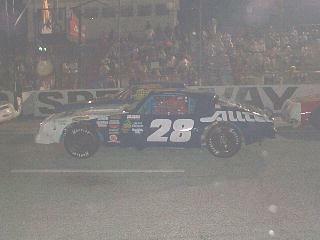 After the race I couldn't get the car to turn into the pit stall, the wheel just wouldn't turn that far. When we opened the hood we found the right front shock snapped in half. Don't know we how we ran as good as we did without a shock, the book says it can't be done. I'm really happy for all the people who help us with our car on our first win of the year. They've worked hard to make us better and it was great to take Patrick Holliway to victory lane for the first time. Mark Davis and his crew had a rough night in Pensacola and spent more time in our trailer getting parts and supplies than we did. 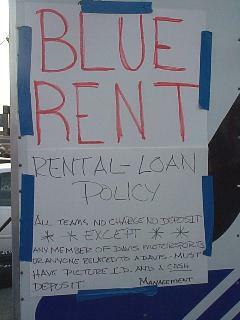 So on Saturday Night in Mobile we had a little sign ready for them. Thomas & Patrick worked hard to get the car whre we needed it and it paid off. Our first win of the year. Patrick's wife Julie made her first appearence of the year at the track. 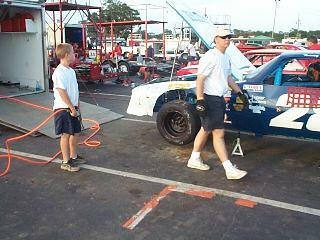 May 11, 2001-Pensacola-Our first trip to 5 Flags and we had a lot of questions about setup with the new tire. For years Pensacola used a Goodyear tire while Mobile used Hoosier. The tires are very different and we like each tire at both tracks but the Hoosiers are too soft for Pensacola and we were concerned as to what would happen to them on long runs, it made for a real learning experience. The setup the guys put under the car was good right out of the trailer, so good we only used the first practice session and saved our tires for the race. At Pensacola, for these shows, we don't qualify we draw for position, Patrick drew 13 for us with an 18 car field. In an effort to make a good car at the end I made a bad call on set up for the beginning and we fell back a few spots at the start. We patiently worked our way back through the pack, stayed out of trouble and ended up with a 6th place finish. As we leave Pensacola we answered some of our tire questions but have a lot more as we get ready for the 43rd Annual Snowball Derby in December. 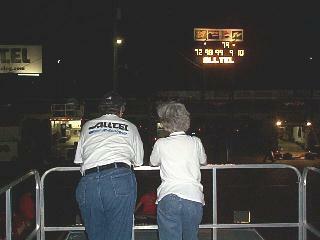 May 7, 2001-Our schedule is finally letting us put together back to back weeks of racing and its starting to show. The car has been really good off the trailer and we are fine tuning to get the best lap times we can. Last week was our fastest qualifying time of the year on only 1 lap. The driver saw his first lap time and decided to do a lot better and drove the car off in the turn too fast and spun out. Both the heat race and the feature were really clean races with few cautions and we were able to gain a few spots in both with 7th and 10th place finishes. Next week we will be in Pensacola on Friday night and Mobile on Saturday. Patrick Holliway is our newest member to the team but is already a big part of the team. Patrick and Thomas getting the car ready to go. 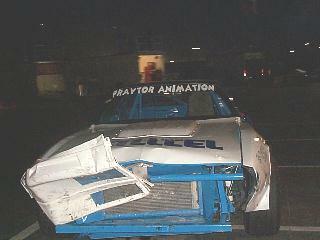 April 28, 2001-After Opening Night we had a lot to work on, tore up car and one that wouldn't handle we had a mess. Thanks to my TV Schedule the guys had a couple of weeks to get it back together and man did they ever. 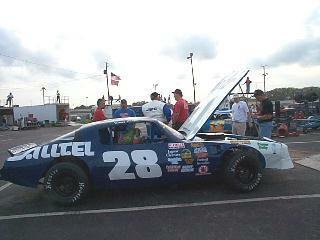 They changed all the set up, rebuilt the front end and we unrolled a pretty good race car. During practice we fought an oil leak problem and loosened the car up some. During qualifying the accelerator hung and I nearly put it in the wall. The poor qualifying put us at the back of the field (18th) and we had a lot of work to do. Going in to the last lap we had worked our way all the way to 6th and lost 3 spots trying to avoid hitting the 2 cars in front of us. Our second outing was much better and we really have something to build on for next week. 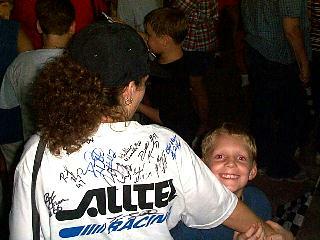 Thats me at the bottom of the picture trying to remember my sponsor. A rare sight, the car witouht a mark on it-after the race. 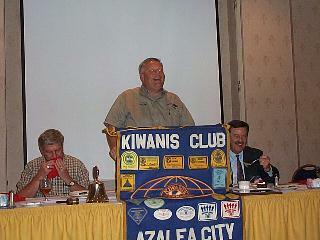 The Kiwanis had me out in April to talk about racing, I guess all the good drivers couldn't get off work that day. I don't think I ever had a more positive attitude about a car we were taking to the track. The guys had worked on the car all Winter to make the best looking race car we ever had. John Phelps our fab guy made some real nice improvements inside the car.. In the last 3 weeks the guys worked hard at test sessions and we were better each time out and faster than we had ever been before. A lot of the good test numbers can be attributed to Tom Claxton and the crew at Claxton Automotive. 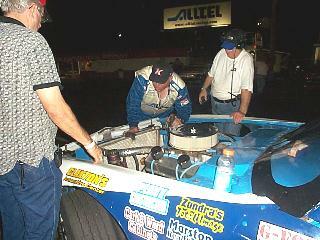 They had the motor out of the car 3 times before we ever turned a competitive lap and there were nights that most of his employee's including Big John were at my shop working to make us better. 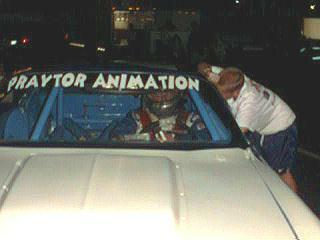 The final setup we put under the car came from a combination of input from Brian Yarber and last years track champion Okie Mason. How do you get better than that? Even on race morning, Patrick Holliway found a major problem with the rear brake caliper on the car, which should have even made us even better but......... We unloaded the car and it was the worse race car I had ever driven. 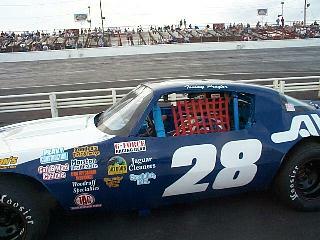 I burned the right front off the car in practice and I qualified it a full 8 tenths of a second slower than we tested. Patrick, Brian & Thomas Praytor went back to work and made wholesale changes before the heat race. We were able to take a 5th in the heat race with a little better car. Before the feature we made more changes and started 15th. after a few laps we worked away up in to the top 10 and got tangled up with the 40 car in turn 4. 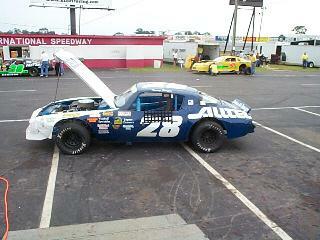 The wreck took the nose piece off but we were able to get back out on the track. A few laps later I hit the 40 car again while he was trying to avoid the car in front of him and poked a hole in the radiator and we were done with a 12th place finish. Best looking paint scheme we've had. Last known picture of the car before I started tearing it apart piece by piece. Even Okie Mason. last years champ tried to help. The end of a bad night. The new paint scheme at the ALLTEL customer appreciation day at the Foley Store. 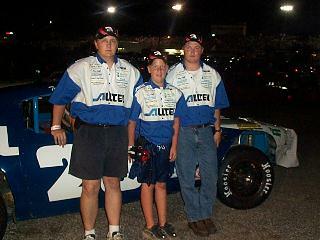 Outside MIS for the ALLTEL Mobile 200 Gatorade All Pro Race. The first day of testing at Mobile was a mixed bag for us. The car had a good balance but was a little on the slow side. By the end of practice we developed a motor problem that is being worked out this week.